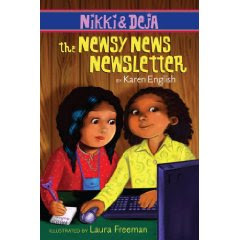 Nikki and Deja: The Newsy News Newsletter by Karen English. Illustrated by Laura Freeman. Clarion Books, an imprint of Houghton Mifflin Harcourt Publishing. January 2010. Reviewed from ARC. The Plot: Nikki and Deja decide to start a neighborhood newsletter. Problem is, what types of things can two third graders report on? Especially when they may not know the whole story? The Good: Nikki, Deja, and their classmates are typical kids, in dialogue, characterization, classroom antics, and as portrayed in the realistic illustrations throughout the book. Children will readily identify with the school dynamics and recognize themselves and their classmates in the too zealous lunchroom monitor, the teasing notes despite the teacher's instructions to treat one another with respect, the gray line between not having permission but not being told not to do something. While Nikki and Deja do learn a lesson about their newsletter (not to jump to conclusions and to really investigate something), everything is not tidely resolved. A great fit for children who are beginning to read chapter books: illustrations, short chapters, realistic stories, familiar friends and surroundings.